You be nice to Dottie Jess. She's on vacation! Besides, you never told us how many marbles you guessed were in there! SHHHHH girl, you gonna have Alex out to whup my behinny!!! I've taken a picture of the marbles. 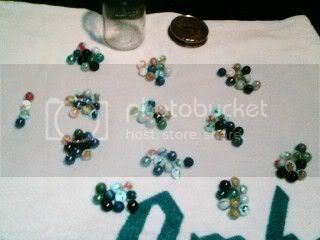 I divided the marbles into 11 piles of 10, and you will see the extra 4 marbles over on the left! You can count them if you want to!! Thanks to everyone who played the game. And congratulations to those of you who guessed the correct number!! Hey, that's a cool way to show the answer! That was a fun thread, David---thanks! Glad you enjoyed it Shasta! If you can think of any interesting or fun quizzes, polls or whatevers, feel free to post them in here!